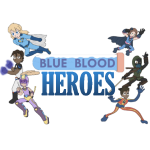 Superpowered, blue-blooded children form into a team of super-heroes. Six children possess a genetic irregularity that grants them super-human powers and turns their blood blue. As criminals and injustice begin to rise in their hometown, they decide to form a superhero team. Lesse... I'm 21. I read a good few webcomics, not nearly as many as I used to, but the ones I follow most closely these days are Misfile, Menage a 3, and Gunnerkrigg Court. Not a lot else to say.